We spoke to our Senior Event Manager Natalie about her time at GetStaffedUK. We are over the moon with Natalie’s progression, going from Go-Getter to Trainee Event Manager, to Event Manager, to Senior Event Manager in 9 months; an amazing achievement. At GetStaffedUK, you have the opportunity to show us what you’re capable of, with progression, training and development at the heart of everything we do. Natalie is an incredible part of our community and we’re proud to have her on board. Find out more about Natalie thinks about GetStaffedUK in the comments below. What do you enjoy about your role at GSUK? First and foremost, I love the variety the company brings whether it’s the venue or the people you work with. I enjoy how versatile the role is. One minute I can be working a stunning wedding in Ulverston then the next I’m at a Liam Gallagher concert managing the VIP check ins. Every shift is different, and I learn so much from each and every event. The company is also very supportive of your outside life which you don’t come across very often. When I first started working for Get Staffed I was studying and Get Staffed were very understanding when I needed time off for revision or exams. This set them aside from other companies for me and I knew that I would enjoy working for a company with such values. The role has definitely helped to develop my team work skills. Get Staffed is special as you meet such a diverse range of people but equally such a range means I need to know how each of us work to create the best team. It has definitely improved my communication skills as well, while I love to talk, the role has taught me how to be concise with my words. Being quick and to the point helps get the job done to a high standard in a timely manner which clients love! My role has prepared me for the future as it has helped me realise the career path I’d like to follow. Previously I had considered a whole different route but working with Get Staffed introduced me to so many different options and now I know that management is right for me. What’s your highlight of your time at GSUK? The highlight of my time at GSUK was definitely managing at The Lytham Festival in 2018. This opportunity really allowed me to exercise my skills and I thoroughly enjoyed it all whilst listening to some amazing music! I met so many interesting people and made important contacts which was topped off by receiving a promotion at the end. I can’t wait for The Lytham Festival this year! How do you feel about your new promotion? I am absolutely thrilled to bits about my promotion. I’ve been in previous jobs where I’ve worked to the best of my ability and not had any recognition for it. Get Staffed have always been quick to recognise my strengths, have worked to improve my weaknesses and given me a great deal of confidence in myself. It feels so fulfilling to be recognised and rewarded for my efforts, thank you Get Staffed, I can’t wait to see what this year brings. http://wp.freedomofcreation.co.uk/getstaffed/wp-content/uploads/sites/116/2016/08/Get-Staffed-Lrg-300x200.png 0 0 georgie http://wp.freedomofcreation.co.uk/getstaffed/wp-content/uploads/sites/116/2016/08/Get-Staffed-Lrg-300x200.png georgie2019-04-12 14:07:492019-04-12 14:07:49Natalie Milton! Parklife is brand new to our summer line up for 2019. We are so excited to get stuck in! We’re looking for hospitality professionals who are ready to get stuck in to the action for this year’s festival. You will need a minimum 1 years bar experience and to be ready to hit the ground running. At GetStaffedUK, we’re a family, which means we all work hard together and enjoy ourselves whilst we’re at it. There’s a real community vibe, and it’s great to be a part of. So here’s the information you need to get involved. Providing excellent customer service, rain or shine! Creating drinks to a specific standard (cocktail roles are available but mainly your standard drinks menu). Enjoying yourself on shift, whilst ensuring that all jobs are complete. Complying with client and customer requirements and ensuring health & safety standards are met. Transport is provided from Preston, Liverpool and Leeds otherwise you must be able to meet on site at the festival. You will be required to work Saturday and Sunday, so please make sure you are available for all dates (and ready to get muddy) before you sign up. You will be required to attend a full induction, training session and brief, where you will be assessed ready to get yourself behind the bar and popping shapes. Please feel free to contact us on georgie@getstaffeduk.co.uk if you require any further information with the subject PARKLIFE. See you in VIP. http://wp.freedomofcreation.co.uk/getstaffed/wp-content/uploads/sites/116/2016/08/Get-Staffed-Lrg-300x200.png 0 0 georgie http://wp.freedomofcreation.co.uk/getstaffed/wp-content/uploads/sites/116/2016/08/Get-Staffed-Lrg-300x200.png georgie2019-03-18 09:28:062019-03-18 09:28:31Parklife 2019! As part of #InternationWomensDay2019 #IWD2019, we wanted to celebrate Chloe! Chloe is one of our Senior Event Managers and our Training & Development Officer. We couldn’t be more proud to have such a strong, independent lady on our team (even if she is a bit sassy). Chloe delivers amazing, professional service and has become one of our clients’ favourites. You know when she’s on your team you have absolutely nothing to worry about. Impeccable eye for detail, strong passion for the hospitality industry and devotion to developing our employees, make Chloe one of a kind. She never fails to go above and beyond, which makes her an incredible asset to GetStaffedUK. Chloe looks after our new recruits, from ensuring they attend a thorough induction, in-depth training session to guaranteeing they are welcomed to their first shift. This includes implementing constant improvements for our training sessions and utilising feedback from shifts to ensure all of our Go-Getters can hit the ground running! As a caring and passionate person, Chloe looks out for every member of our team, work related or not, she’s a rock to many of us. With our employees at the heart of everything we do, Chloe is a key member to the success of GetStaffedUK and is currently assisting with the advancement of our online platform, which will include a variety of training and development levels, alongside accreditation and qualifications. This will all contribute to us changing the industry for good, changing the perception that hospitality professionals are low skilled and unreliable whilst empowering our Go-Getters and providing them with opportunities, allowing them to reach their full potential. Not only does Chloe provide training and inductions to our newbies, she works with current Go-Getters and managers closely to help them improve daily. Whether you want to freshen up the skills you already have or move towards your own personal goals in other areas; Chloe’s ya gal. WE LOVE YOU CHLOE, LETS CELEBRATE YOU, THIS INTERNATIONAL WOMENS DAY! http://wp.freedomofcreation.co.uk/getstaffed/wp-content/uploads/sites/116/2016/08/Get-Staffed-Lrg-300x200.png 0 0 georgie http://wp.freedomofcreation.co.uk/getstaffed/wp-content/uploads/sites/116/2016/08/Get-Staffed-Lrg-300x200.png georgie2019-03-06 15:21:472019-03-06 15:22:29Chloe Brookes! We are extremely proud to announce two of our managers have been nominated for the BID Preston Smiles Better Awards. Lets get voting for Marty Meadows as the Leisure Manager of the year! Here’s why Marty deserves your vote. As one of our client’s favourite members of the team, Marty goes above and beyond every single shift. Marty is one of our Senior Event Managers and takes on the responsibility of inducting every member of the team. He takes our Preston inductions every week and often finds himself in Liverpool, Manchester & Leeds, helping us ensure that everyone who signs up to be part of GetStaffedUK is ready to hit the ground running, whilst providing a warm welcome. You’ll have seen Marty with us from day one, helping us grow. Whether its ensuring a smooth shift, providing recommendations and feedback, helping us train staff and providing constant motivation. Marty always has a smile on his face and is happy to help our team members. You know when Marty is managing the team on your event, there won’t be any problems. Feedback about Marty’s management is always amazing, to the point every client requests him on their shift! We have everything crossed he wins this award; it’s absolutely the recognition he deserves. His degree in coaching has been very beneficial to his role, he can lead and motivate a team with ease, keeping company culture at the heart of everything he does. Taking different teams to different events and venues throughout the North isn’t everyone’s cup of tea (nor an easy job) but he absolutely smashes it every week! Well done Marty. VOTE FOR MARTY HERE: smilesbetterawards.co.uk – No 6. Lets get voting for Sean Devlin, for Best Customer Service in Leisure 2019! Here’s why Sean deserves your vote. Another client favourite, Sean really shows us how it’s done. Not only is his customer service a firm favourite with our clients (who absolutely adore him) but the customers too! Sean’s ability to whiz around a bar and whip up some cocktails, are nothing short of impressive. Whether he’s a one man cocktail bar, or leading a team of 50 across Victoria Warehouse (or a field for that matter), Sean’s got his customer service skills DOWN. Smiley, happy faces are whats to be expected when Sean’s around! Looks like it’s the luck of the Irish this year. VOTE FOR SEAN HERE: smilesbetterawards.co.uk – No 12. Creamfields is a whole different ball game. Do you think you’ve got what it takes to spend incredible moments with our amazing team in a field for 4 days? We thought so, get involved with Creamfields 2019. Transport is provided from Preston, Liverpool and Leeds otherwise you must be able to meet on site at the festival. You will be required to work Thursday to Sunday or Friday to Sunday, so please make sure you are available for all dates (and ready to get muddy) before you sign up. You will be required to attend a full induction, training session and brief, where you will be assessed, ready to get yourself into camp! 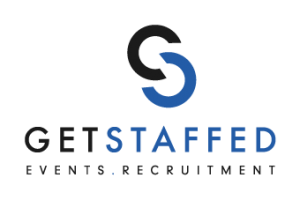 Please feel free to contact us on georgie@getstaffeduk.co.uk if you require any further information with the subject CREAMFIELDS. See you in VIP. Here’s a list of things to do this Valentine’s Day in the North West, whether you’re with your other half or pals! Catch The X Factor Tour this weekend! Head to Fino Tapas for their special menu! No scrooges here, if you have any more ideas or think we’ve forgotten anything, drop us a comment! Do you think you can handle the crowds? Good, we’d love to have you at Lytham Festival 2019. Transport is provided from Preston, otherwise you must be able to meet on site at the festival each day (no camping). You will be required to attend a full induction, training session and brief, where you will be assessed, ready to get yourself onto Lytham Prom. Please feel free to contact us on georgie@getstaffeduk.co.uk if you require any further information with the subject LYTHAM FESTIVAL. See you in VIP. We are very excited for our Senior Event Manager, Tyler. He’s recently gained an Internship through his Event Management course at UCLan at the second largest Marriot hotel in the world. Tyler has been an invaluable member of the team at GetStaffedUK and is about to embark on a new journey to Texas, USA. Tyler orginially studied Sports Journalism, but as his career and enthusiasm progressed within the Hospitality Industry, he changed courses to Event Management to pursue his passion. As a massive fan of American Football and extremely good player, this is a very good move for Tyler (although we’ll miss him dearly), he’s looking forward to being part of a public team over in America. Tyler’s new role will involve lots of training and learning, which he’s delighted about stating “looking through my personal program outline makes me twenty times more excited”. As Restaurant Supervisor, the topics covered include Restaurant Operations, Private Dining and Shift Lead Training. As Senior Event Manager, Tyler feels he is prepared for his new role. He is always ready to take a step back from a situation and provide solutions, a transferable skill, he will be able to take with him into any future role. 2018 has been an incredible year for GetStaffedUK. We’ve exceeded client expectations, which is demonstrated through the testimonials we have received, the recommendations which our clients have given to their sister venues and we’ve even managed to improve the perception of staffing agencies on the whole within the areas which we have worked. This is all down to our incredible team! We’ve gained many new clients over the past 12 months, thanks to our Go-Getters who are in and out of different venues, week in, week out – as well as our Business Development Director, Junior who came on board in July. At GetStaffedUK, we are aiming to revolutionise the hospitality industry. We are aiming to improve staff reliability, retention and quality. Each of our new roles is helping us towards our mission and it’s so exciting to see the business develop so quickly. In order to achieve our goals, we knew we needed to do more than show that we could staff events – so we developed GetTrainedUK, and GetGroupUK was born! What a whirlwind of a year it’s been. We appointed Chloe to manage our training as we grew rapidly over the summer… and our office team grew and grew until we could no longer stay in our little cosy office. We moved into our new office which could just about accommodate 5 of us, and then moved again, and now we have the entire basement at Cotton Court. We are so proud of how far we have come. This environment has really made a different to our work and productivity, not only do we have more space for ourselves, but we have meeting space, a cosy area and ping pong – all of which is very beneficial for when our team want to pop in and see us. It’s great to have our open door policy and for our team to know that they can pay us a visit whenever they need to! Massive shout out to our Senior Event Manager Sean who helped us fill our rotas and complete our day to day tasks over the summer; from Lytham Festival to Creamfields and everything in between – Sean you were brilliant! We have grown more than 350% on year 1, servicing over 150,000 hours of work and working with over 70 clients. We are over the moon with the new clients who we have supported (and who have supported us) over the past 12 months (nearly doubling on last year!). This is including 5 new sport stadiums, huge concert venues which have moved the company further into Leeds, Stockport, York and Liverpool allowing us to create a stable base of GetStaffedUK family across the North West, all of who are creating a fabulous impression on us on and our clients. We can’t wait to see what 2019 brings! We have trained 3000 Go-Getters in Hospitality Skills, inclusive of our bar training, cocktail tending and food service academies. These are having a massively positive impact on our employees and the feedback we have received from employees over the past few months just shows how far we have come along. We’ve been working on our employee engagement, streamlining our processes and ensuring that all of our team enjoy their experience at GetStaffedUK. Working at huge concerts including Florence & the Machine, Mumford & Sons and You Me At Six. Being sole suppliers to various events and venues, starting from helping with kiosk bars to running hospitality sections! The list goes on and on…. but we like to keep it short and sweet. http://wp.freedomofcreation.co.uk/getstaffed/wp-content/uploads/sites/116/2016/08/Get-Staffed-Lrg-300x200.png 0 0 georgie http://wp.freedomofcreation.co.uk/getstaffed/wp-content/uploads/sites/116/2016/08/Get-Staffed-Lrg-300x200.png georgie2019-01-04 19:10:282019-01-04 19:19:222018 Round Up! 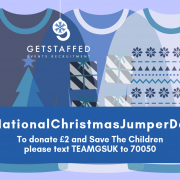 On Friday 14th December, we’re taking part in #NationalChristmasJumperDay for Save the Children UK! 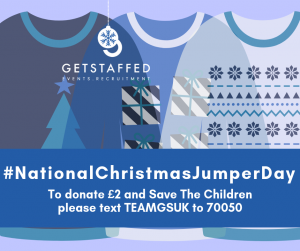 Thousands of people up and down the UK will start their day by pulling on a Christmas jumper for a great cause – to help create a brighter future for children. Whether you join in at work, at home, at school or down the pub, it’s all about getting everyone together in your daftest woollies. We’re particularly excited to see what jumper Tom Havlin turns up in! You’ll be giving children the chance to build a better future, by donating £2. To do so, please text TEAMGSUK to 70050!